The spectacular coast and cities brimming with history are calling…get ready for an awesome Croatia road trip. Croatia is blessed with 1,800 kilometers of rocky, indented and spectacular coastline and more than a thousand islands. All this is surrounded by the turquoise waters of the Adriatic. The best way to see Croatia is definitely by car. Highways are modern and well-paved, distances are quite short and one has the freedom to stop wherever it feels right. Croatia’s infrastructure has improved massively in the last few years, making driving Croatia safer than ever. There is a lot to see in this region; during our 9-day Croatia road trip, my father and I explored countless sights across Croatia. Thanks to it being the low season (our trip was in November), both the highways and the sights were crowd-free, making it even more enjoyable and special. If you can choose, the perfect timing for this kind of trip is in May, early June, and September and October. In November, one got to be lucky. Never, NEVER go on Croatia road trip in July and August, unless you want to find the cities crowded and pay the expensive price for accommodation. Traveling car is definitely the best choice: you have the freedom to stop whenever you want, even if it was just for a quick refreshing dip in the see along your road. Me and my father used our own car, but if you need to hire one, I recommend using Autoeurope, where you can do everything stress-free and online. If you are not driving, there is still the option to use the public transportation is another option: however, you will have to be counting with spending more time waiting on a bus and transferring. 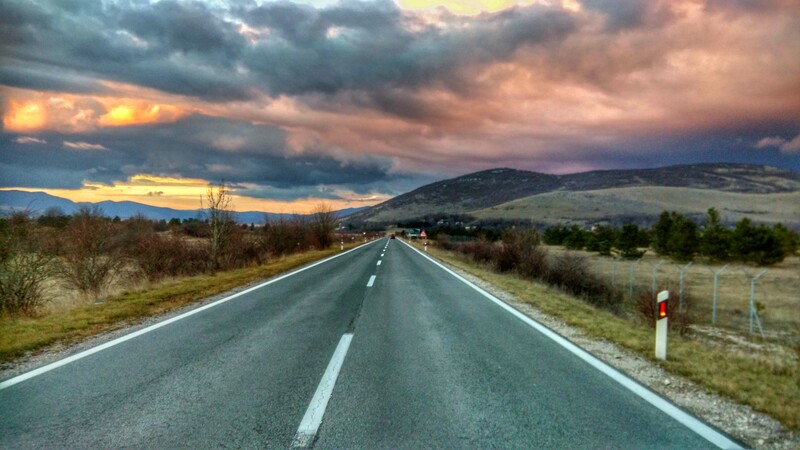 It will all take more time doing the same Croatia road trip as in this article. Keep in mind that there are lots of island in Croatia, so you can also use boat from time to time (I really love it). Comfortable walking shoes: in most cities, you will park the car and explore the area by walking. Croatian cities are often pawed with cobblestone. Bring both sandals and trainers so that you have a choice. Beach towel and swimsuit: a huge and soft towel is an essential thing to survive on Croatia’s rocky beaches. Try not to use the hotel towels from your local accommodation, it is often seen as rude. Water shoes: if travelers often forget something, then it’s the shoes for swimming. Keep in mind that the rocky coast makes it nearly impossible to get to the water without proper shoes. Are you planning to visit Croatia offseason? Check out my other post about Croatia in winter.. 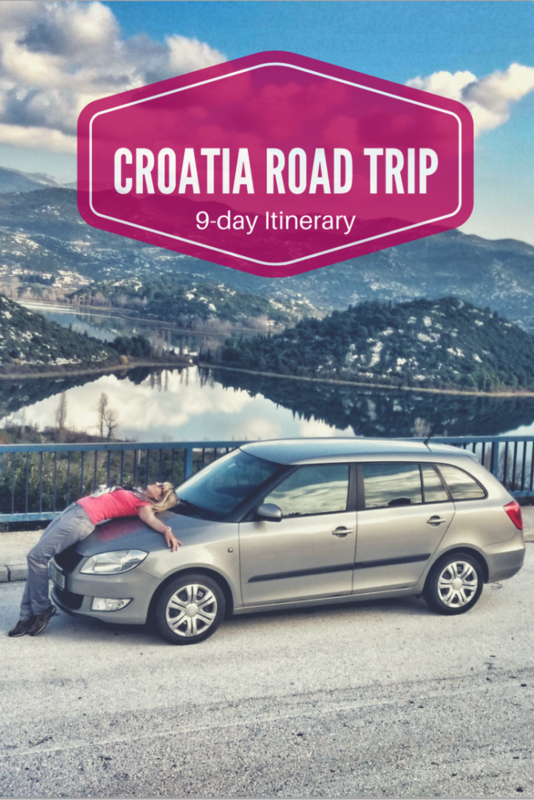 I created this post so that you can get inspired and plan your own perfect Croatia road trip. Over the course of 9 days, we drove approximately 3000 kilometers in total. We were using our own car, therefore the start and end of our route was Czech Republic. We drove across Croatia from north to south, with one day trip to Mostar in Bosnia and Herzegovina. With good spirits and favorable weather after reaching Dubrovnik, we decided to prolong the trip to Montenegro. 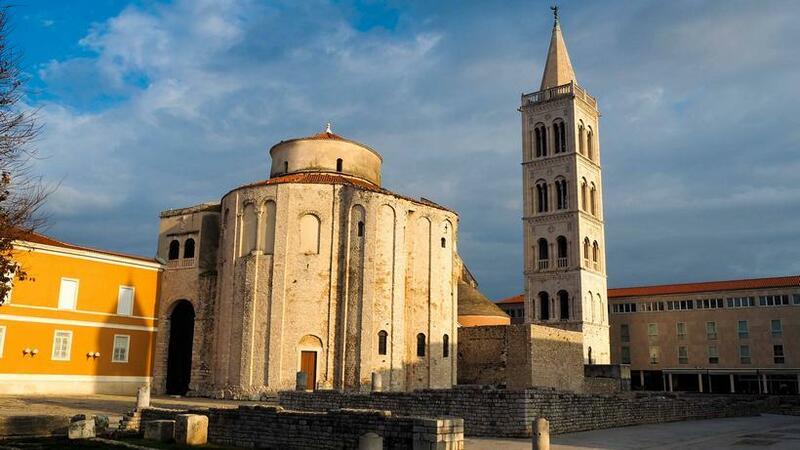 Why should Zadar be included in Croatia road trip? Should moving to Croatia ever come into consideration, Zadar would be my first choice. It’s just the perfect marriage of history and a cosmopolitan atmosphere. Even though I have been to Zadar a few times already, this city never gets boring. 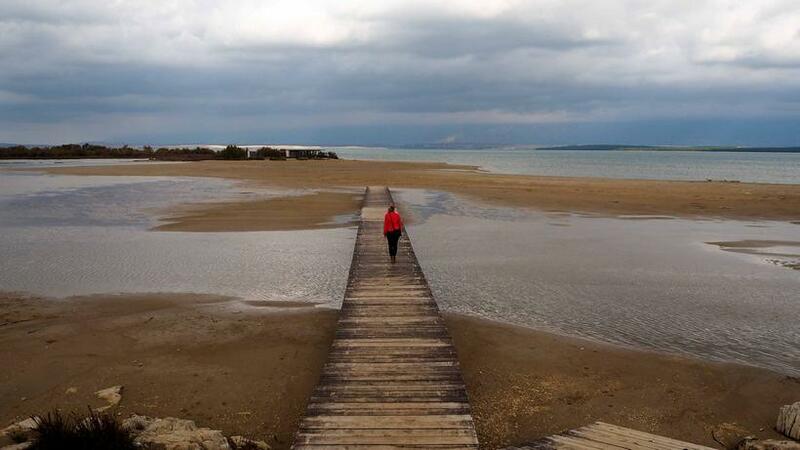 Zadar is a perfect walker’s destination. The pedestrian-only historical center is packed with churches, Roman ruins and medieval architecture. The maze of dreamy marble-clad alleyways imprinted Zadar into my mind – for some reason, the cobblestone in Zadar seems whiter than anywhere else in Croatia. Head to the promenade to experience two of Zadar’s highlights: Sea Organs, which produce organ-like sounds from beneath marble steps when struck by waves from the sea, and the circular Greeting to The Sun visual installation that turns Zadar’s renowned sunsets into once-in-a-lifetime experience. Why should Nin be included in Croatia road trip? Nin, a tiny city surrounded by a shallow lagoon, is a complete hidden gem just a stone’s throw from Zadar. The setting is very charming: Nin’s Old town is situated on a small heart-shaped island connected to the mainland by two bridges. One great thing about Nin is that you can wander around and find traces of many civilizations – there is 3000 years of turbulent history on display here! As there was a local festival taking place, we got the great chance to enjoy it with locals in the neighboring village of Zaton. Dragan, the owner of our accommodation in Zaton invited us to sit at his family’s table. 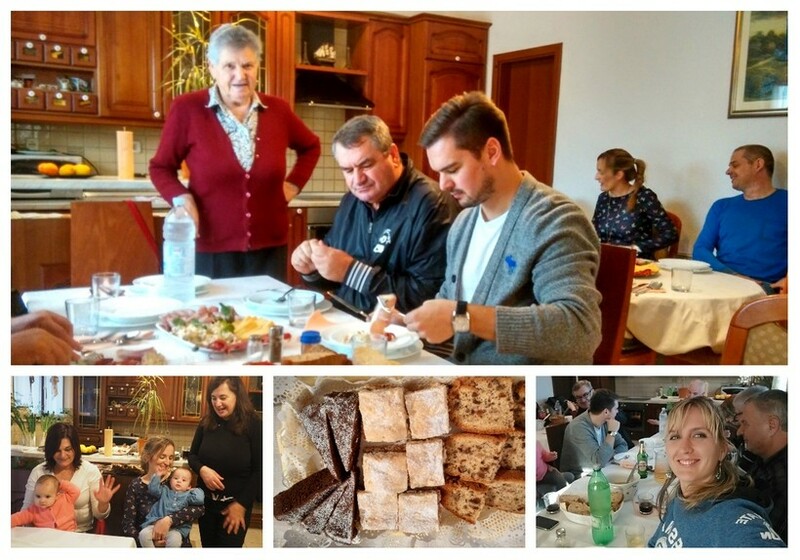 Croatian hospitality is amazing – our lunch turned out to be three hours of continuous eating. Every time you finally finish a plate, they always insist on giving you more. 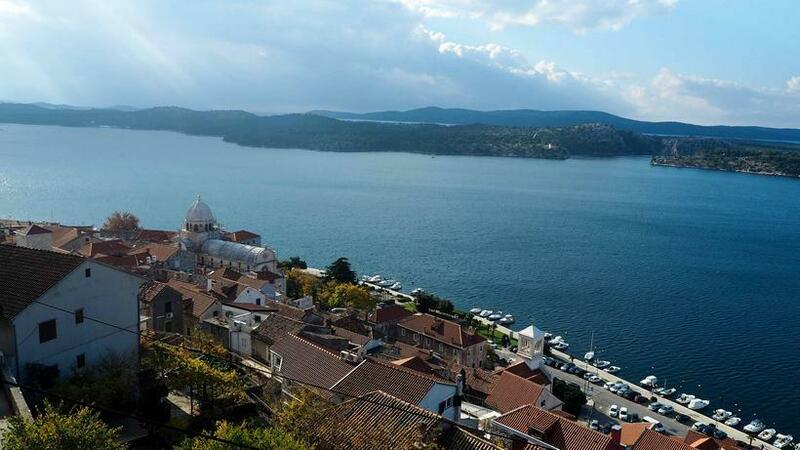 Why should Sibenik be included in Croatia road trip? Situated at the heart of a deep bay, Sibenik is one of the most naturally protected harbors on the Adriatic coast. It’s not as popular Zadar or Split, yet it makes for a pleasant stop on any Croatian road trip. It’s the Sibenik’s massive cathedral – the Cathedral Sveti Jakov, dating back to 1434 and a listed UNESCO site, that makes Sibenik worth visiting. It’s the most important architectural monument from the Renaissance in all of Croatia. Following a 20-minute walk up the steep hill, you can also visit the ancient St. Michael Fortress guarding this harbor town. To our surprise, the ticketing office was in operation even in the low season; we paid 110 Kuna (15 Euro) per person. In exchange, we got an epic 360 degrees panorama of the town. 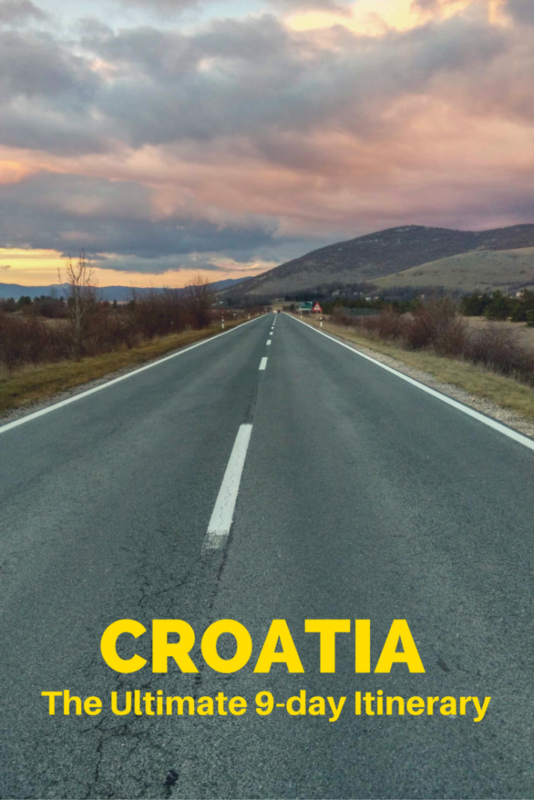 Why should Split be included in Croatia road trip? With so many places to choose from around the Adriatic coast, the powerful emperor Diocletian chose Split as the place to spend his retirement. Diocletian’s Palace, a Unesco World Heritage site dating back to A.D. 295, still represents the center of the city. This majestic complex takes quite some time to explore – with 200 buildings and what were once 20-meters-thick outer walls, this was once a world of its own. 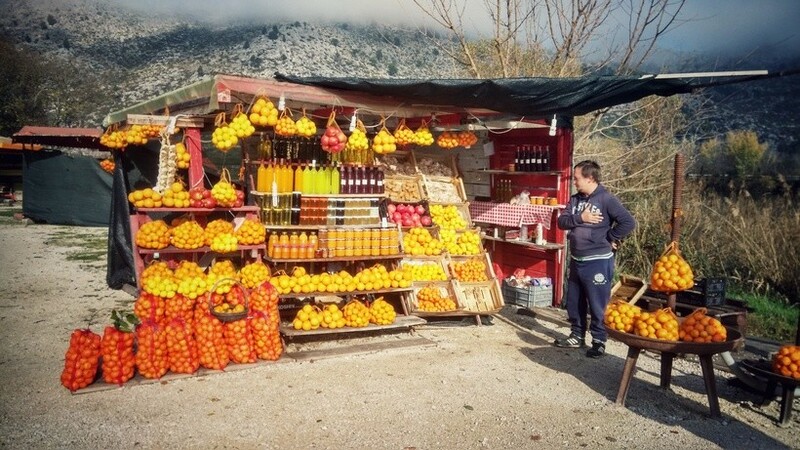 Head to the lively Green Market (Stari Pazar) to experience life in typical Dalmatian town. 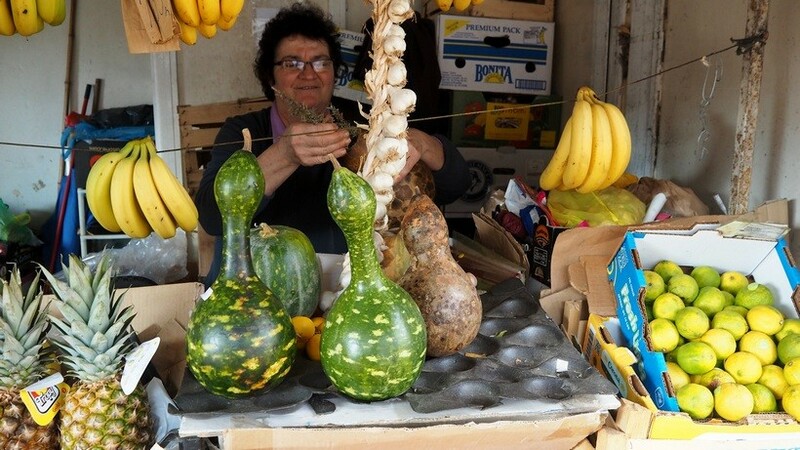 They sell some of the best vegetables, fruits and a number of regional specialties. We ordered a calamari from one of the stalls. So tasty! Why should Brist be included in Croatia road trip? The mountains behind Brist are perfect for exploration; interestingly enough, this is where the village was originally settled, before they rebuilt it on the coast. Just try to hike up there and you will understand why they moved it – its crazy steep! Although Brist gets really packed during summer, in winter it’s just a quiet fishing village. We could only found one single restaurant that was open (Restoran Kadena in Gradac). As we were the only guests, the waitress gave us a free desert after we finished our meal. How about escaping Croatia for a day? Jump in a car and head to neighboring Bosnia and Herzegovina, with Mostar just two hours away. Forget about the highway and pick the more scenic old road passing the spectacular Bacina lakes, which are connected by channels. The road goes though a fertile region called the Neretva Valley. It’s all about agriculture and fruit, with 80,000 tonnes of mandarins produced every season. This “orange gold” was insanely cheap (one kilogram for just 2 Kunas/0,60 Euros!) We got a 10 kg bag and a bottle of mandarin liquor before heading on to Bosnia. Going to Bosnia? 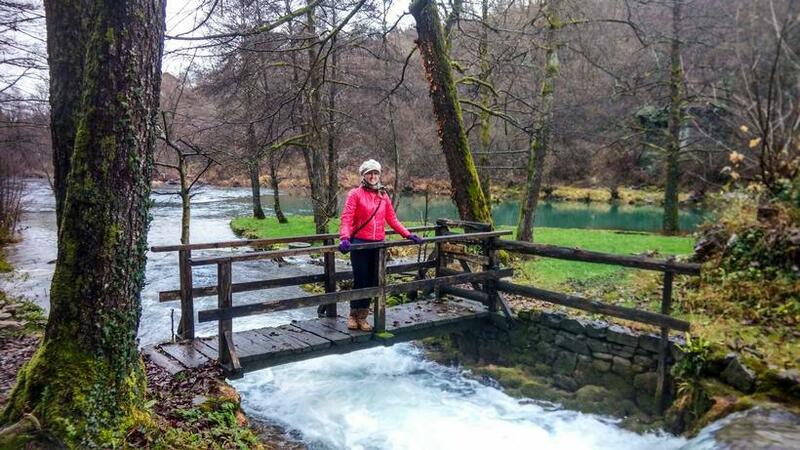 Check out my other post Things to do in Bosnia. 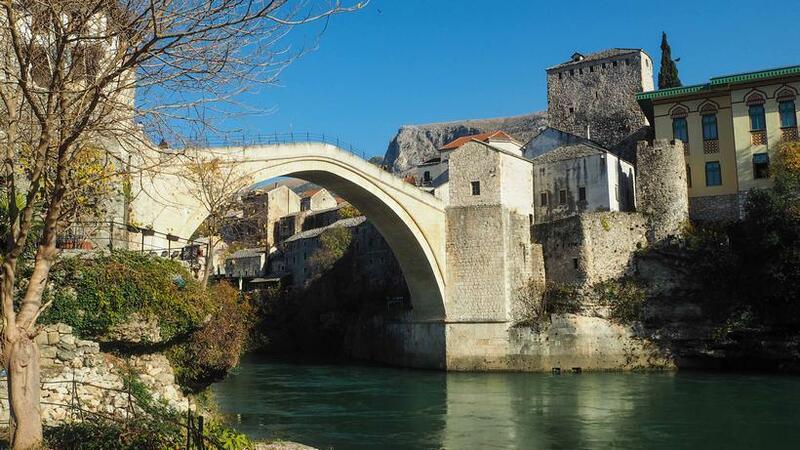 Mostar is a thrilling place for history lovers. It was the most heavily bombed city in Bosnia and yet remains surprisingly pretty. The centerpiece of the town, the Old Bridge, destroyed and rebuilt 11 years later, spans the dazzling and freezing cold Neretva River. You can truly feel the Turkish influence, with countess mosque minarets standing out from the city’s skyline. PRACTICAL TIP FOR MOSTAR: If you want tips from a knowledgeable local, talk to Miran from iHouse Travel. His Things to do in Bosnia is also a great place to stay if you are on budget. 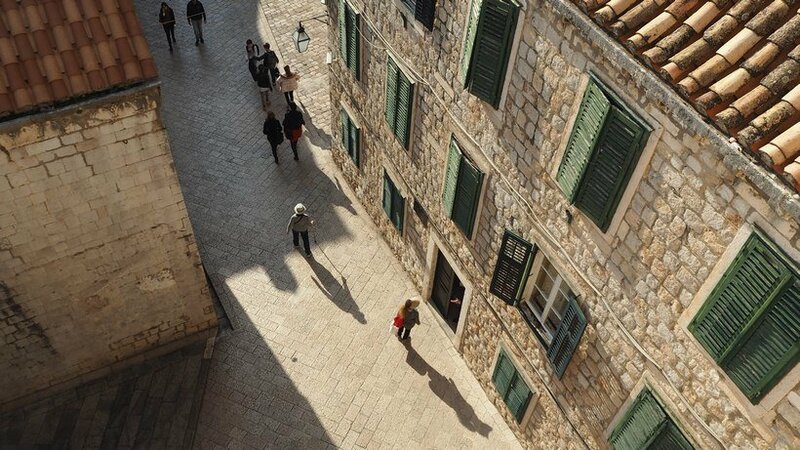 Why should Dubrovnik be included in Croatia trip? Nicknamed the “Jewel of the Adriatic,” the historical city of Dubrovnik is the highlight of any Croatian journey. The city features two kilometers of well-preserved city fortifications; wandering above the rooftops and soaking up the lively atmosphere of the inner city was my favorite moment of the whole Croatia road trip. With such a beautiful city within, no wonder the locals did such a tremendous job at building defensive architecture. 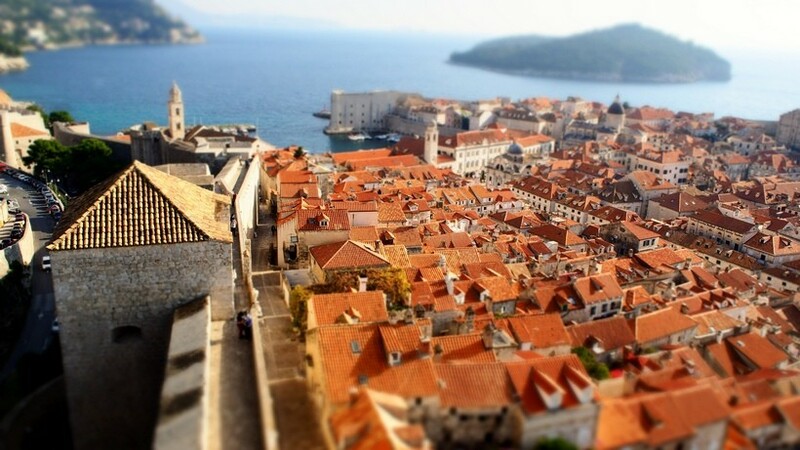 Dubrovnik has always been a strategic place facing the Adriatic. It’s the first island-protected port on the maritime route going from Greece towards Venice. After completing our visit of the Old Town, which was dressed in Christmas colors thanks to the annual Dubrovnik Winter Festival, we took the four-minute cable car ride up to enjoy views of Dubrovnik and the Elaphiti islands. Dubrovnik certainly didn’t disappoint and there is a lot to see – I am coming back here for sure! 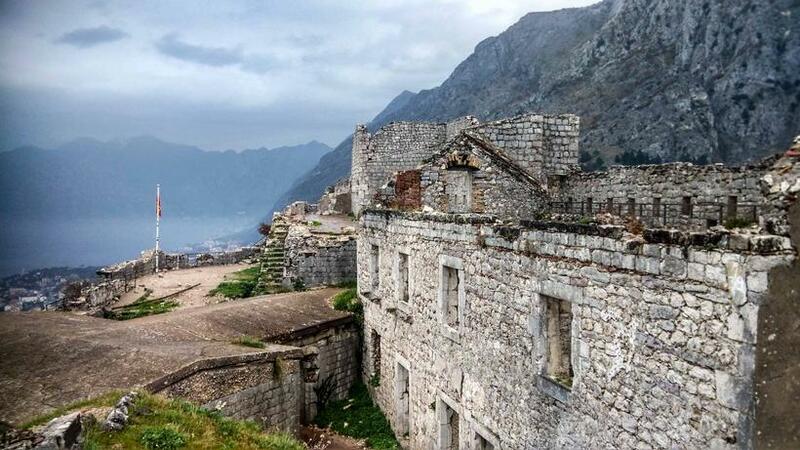 Why should Kotor be included in Croatia road trip? It would be a pity to wrap up a road in Dubrovnik, with another highlight waiting just around the corner. Prolong your trip to Montenegro and pay a visit to the medieval town of Kotor, set in a fjord-like bay which happens to be the deepest one in the Mediterranean Sea. The Old Town (Stari Grad) itself is tiny but charming. Once you enter through the Sea Gate, you will immediately find yourself on the main square (Arms Square). 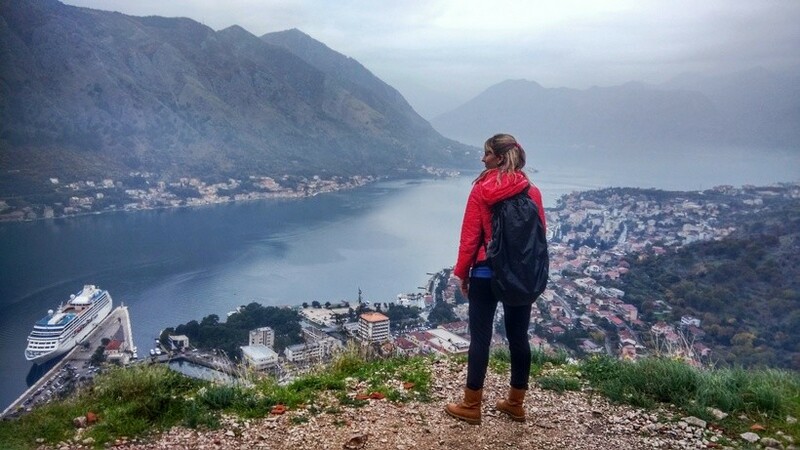 There is an amazing hike to do in Kotor, but it’s not for the faint of heart. On the way to the ruins of Rozafa Castle, we had to climb up 137 uneven stairs perched on a steep hill. As a reward, we got a spectacular view of the city, lake, and nearby Albanian Alps. The gloomy and rainy weather gave it a mysterious look. Featuring about forty beaches in the vicinity, Budva is popular sun seeker’s destination and the most visited place in Montenegro. In summer, it’s packed (mainly with Russians and Ukrainians), but the low season enabled us to experience the coastal town in a more quiet setting. 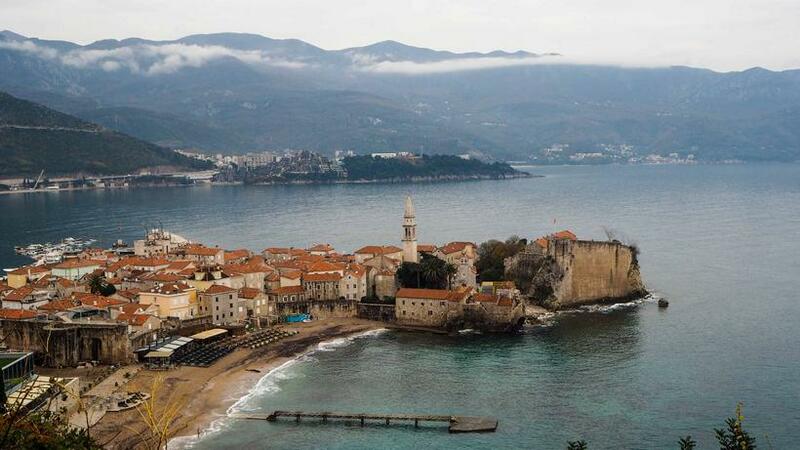 We explored Budva in reminiscence of my father’s childhood memories. About half a century ago, he was here on holiday with his parents. Unfortunately, we only found an empty construction area as hotel Plavi Horizon has already been taken to the ground. Despite the rain, we continued our coastal explorations by visiting the island of Sveti Stefan. It was with luck that we got a private guided tour and had some time to wander around. It was the last place we visited in Montenegro. We stopped in Slunj, a town in mountainous Central Croatia, on our way back. The trip from Montenegro to Czech Republic would be too long to do in one go. We visited cute Rastoke waterfalls, another hidden gem not many people visit. Slunj is mainly known as the gateway to the Plitvice lakes, one of Croatia’s most celebrated national parks. Unfortunately, the approaching snowstorm changed our plans; we could not risk getting stuck on the way and departed earlier. Plitvice just wasn’t meant to be this time. I guess sometimes it is okay to miss out on a highlight or two, leaving some lingering curiosity and a reason to come back! PRACTICAL TIP FOR SLUNJ: Lots of accommodations around Plitvice lakes are aging and really old fashioned. If you prefer modern style, renovated House Ivana is an amazing choice. For booking on Air Bnb, use my $20 travel credit! 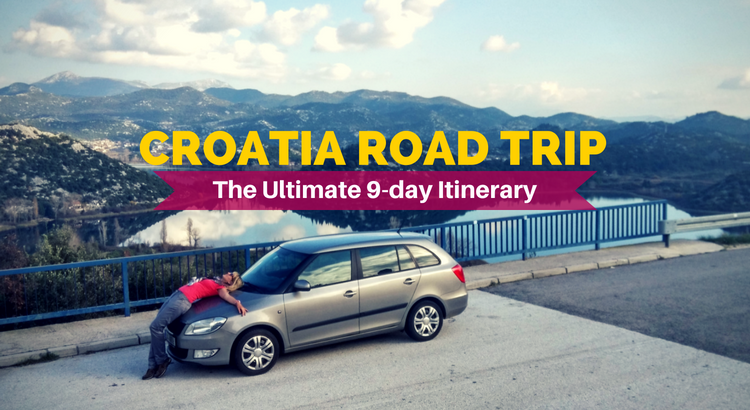 HAVE YOU EVER DONE A CROATIA ROAD TRIP? I am exited to hear about your experience. If you enjoyed the article, don’t forget to share it on Facebook or Pinterest. Thanks for reading! My trip was in partnership with Balkanvibe. Great tips, Veronika 😉 Make me miss Croatia, should go back again. Cool! Glad you like Croatia. Maybe Istria would be great place to go! Croatia has been on my must see list the past two years after seeing so many amazing photos of this beautiful country. It never occurred to me that you could do it via DIY road trip! That’s an awesome way to experience a country and see more! I love the flexibility driving yourself gives you with making stops whenever you see something that interests you! It really looks like an awesome trip, thanks for the idea! Hi Megan, thanks for your support! Yeah going by car is great – especially in the low season, when the highways are free. Great itinerary. But I love strolling in those old towns. I think I’d never want to leave them and get back into the car. Hi Carol – yeah sometimes I had the same feeling. But going by car in Croatia is experience itself, too. Especially the Adriatic highway. I love Croatia and one of the best ways to see the country is by car. I am glad you included Split! It is one of my favorite cities in Europe. Also pumped to see you included Mostar in Bonsia. Well I didn’t spend too long in Split this time. And Mostar – why not, when it is so near and the way from Dubrovnik is spectacular! Hi Mellissa – you are right, my father is walking everywhere and telling stories from our trip! My uncle is Croatian and speaks fondly of his home country. 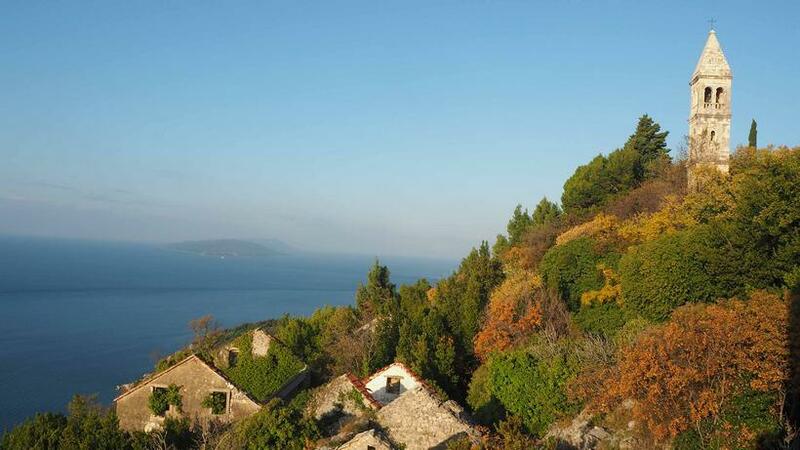 There are also more and more people talking about how Croatia is a must travel destination. Your post definitely shows that as well! Yep, Croatia is the place to be! How much did it cost you aprox? Hi Esther, biggest expenses are fuel and accommodation. We had our own car and did it with two people. You should be counting with approximately 800 to 1000 Eur if you want to do all. If you go on you own, it could be the lower number. Croatia looks so beautiful and it seems like there is so much culture there! I love how you mentioned that Zadar is walker friendly (very important to know when traveling) and that it has a very cosmopolitan atmosphere- something many probably wouldn’t expect. Hi Steph! Nice to meet you online! Yep Croatia is amazing. For people from Czech republic it is not too exotic, as it is one of our closes seas. Yet we like it there – also because it is easier to understand Croatian for Czechs, and also we find the people very hospitable. Hi Veronica – thank you for sharing your experience. I am currently planning a 12 day trip (during summer) from Zagreb – plitvice – Zadar – Sibenik – Split – Dubrovnik with a side trip to Mostar. Had been considering Kotor and now I think I’ll definitely include it. You should, Kotor is really stunning. Once when you are in Dubrovnik, it’s easy to get to! This is a great article and I just loved that you drove all of this yourselves. As a big “self-driver” I love these kind of trips. Croatia is a country where I’ve only spent a small amount of time but loved every bit of it. We actually stayed in a groovy apartment literally inside the Diocletion Palace walls and with a view of the promenade. Amazing. I didn’t get to Zadar, or most of these other places. Something to add to my never ending lists of places to visit. Hi Kerri, thanks for your comment. Great that you enjoyed Croatia, too. 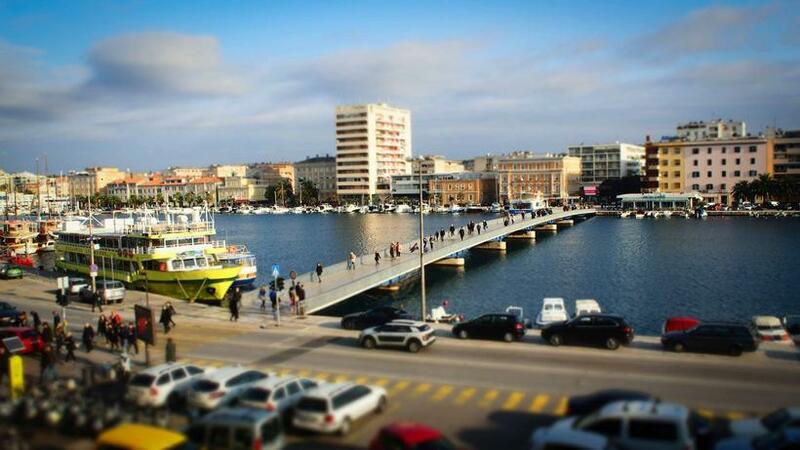 Zadar definitely deserves your visit, too! I love when cities have pedestrian-only areas. Zadar sounds really lovely to walk around! And how nice to be able to experience so much with your father. That will always be a cherished memory. Croatia is a magical place and I’d love to do a great road trip through the country. You picked some wonderful spots and have some great pics to show for it. 9 days is a good amount of time to devote to a road trip and if you’re adventurous you can see a lot but if not, you can still have a great time. Croatia is at the top of my bucket list. I’m hopeful we will make it before too long. Cool, Hanks – thanks for the images! Looks like a fabulous trip! 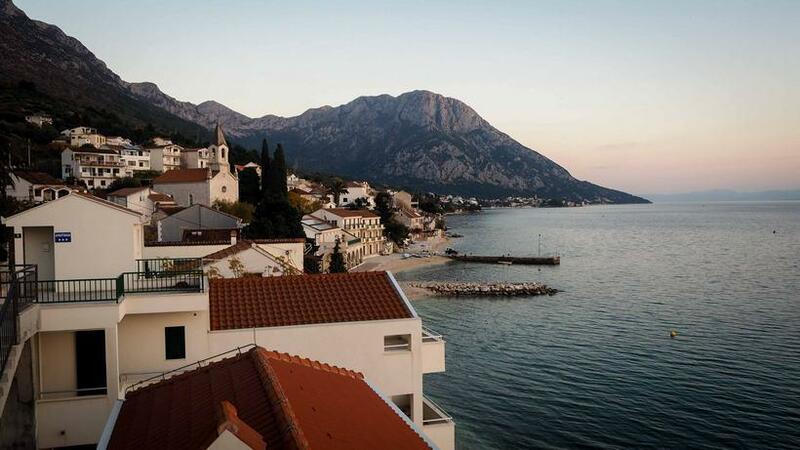 Am a fan of all 3 countries you visited and currently residing in Montenegro. Let me know if you are heading back this way and want to take the inland tour and see a whole different yet truly fascinating aspect to the Balkans with mountains, adventure, and farm stay. Cool! Yeah there is a lot to see in Montenegro as well – at the moment I am not planning to go back though. What a great trip! We also did a road trip – Venice-Slovenia-Zagreb-Plitvice Lakes-Split-Dubrovnik-Mostar-Sarajevo. Amazing time! I wouldn’t travel there other than by car – such a cool way to get around. 2 1/2 weeks total and I already want to go back! Yeah, that is quite similar route! Cool! Great blog post ! I went once to Croatia (summer 2016), I loved everything in this country ! I filmed everything to make vlogs on my YouTube channel 🙂 Anyway, it made me want to go back in Croatia ! I am sure your videos looked great, as Croatia is really stunning. If you liked Zadar, you will love Trogir on the water, a bit further down the coast by Split. Cleaner and much more charming with less traffic and no graffiti, compared to Zadar. I actually visited Trogir some years ago, and you are right, it’s an amazing place to be. 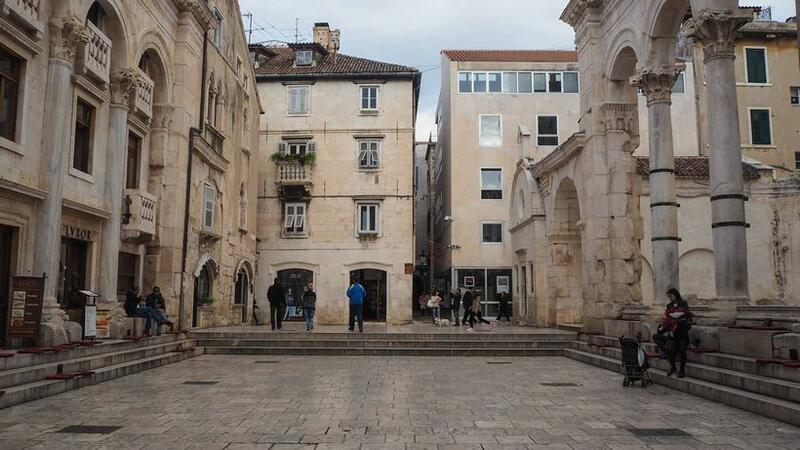 I think it’s more charming than Split, as the city centre is rather tiny. Thanks for recommendation! I love the Adriatic. 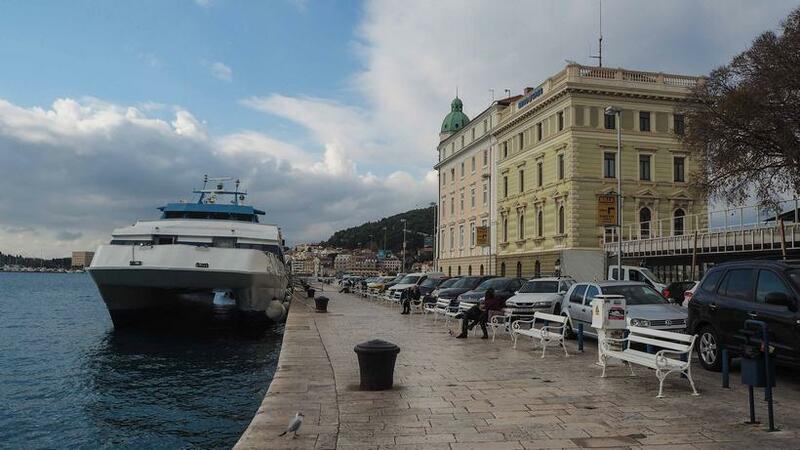 We’ve made it to 3 of the places on your route: Kotor, Dubrovnik and Split. We also took a Dubrovnik detour to nearby Cavtat, which is quite picturesque. The next time we go I want to see Trogir. I’ve read it’s quite special. I visited Trogir some years ago and yep, it was amazing. All of those were my favorites! I can’t say!